An amber crape dress Out white sarsnet, trimmed with pearls or white beads, with a demi-train; a light short jacket, rather scanty, with two separate fancy folds, depending about three quarters down the front of the skirt, forming in appearance a kind of Sicilian tunic, and trimmed down each division, like the bottom of the dress, with a single row of pearls: short sleeves, not very high above the elbow, fitting close to the arm, and ornamented at the top with distinct points of satin, the same colour as the dress, relieved by pearls; two rows of the same costly material or of beads, according as the robe is ornamented, form a girdle. The hair dressed in the antique Roman style, with tresses brought together and confined at the back of the head, terminating either in ringlets or in two light knots; a braid of plaited hair drawn over a demi-turban formed of plain amber satin, with an elegantly embroidered stripe of white satin, separated by rows of pearl, and a superb sprig of pearls in front. Necklace of one single row of large pearls, with earrings of the Maltese fashion to correspond. 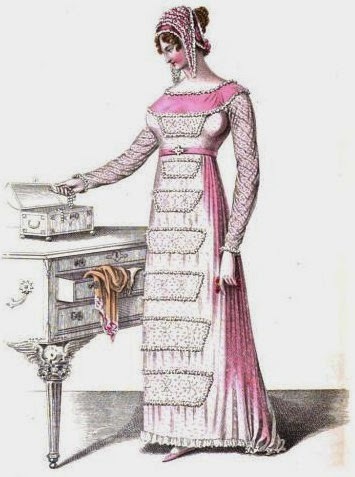 Ridicule aux getons of slate colour, shot with pink; the firm base secured by a covering of pink stamped velvet, with pink tassels. Italian slippers of amber, fringed with silver, or ornamented round the ankle with a row of pearls or beads. White kid gloves. —This elegant drew owes its invention to the tasteful fancy of Mm. Schabner, of Tavistock-street. A scarlet Merino cloth pelisse, lined with straw coloured sarsnet, trimmed with light coloured spotted fur, and attached with loops of black siik cordon and rich frog tassels; the broad fur in front, forming a tippet, pointed at the back. 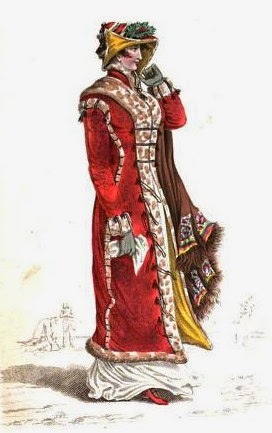 A narrow fur passes ‘from the top of the sleeve, is brought down the side seams, and relieved by fastenings of black silk cordon; four loops with frogs ornament the shoulders and cuffs; plain standing up collar tied with cordon: a fine cashemire shawl, with brown ground, and richly variegated border, is generally thrown over the dress, in which is united both comfort and elegance. A Swedish hat of the same materials as the pelisse, lined with straw colour, and fastened up one side; the crown trimmed with two rows of narrow spotted fur, and one still narrower at the edge of the hat; a bunch of the Christmas holly in front, and two tassels falling from the summit of the crown, of black, to answer the pelisse, which is worn over a white round dress, either of plain or corded cambric. Beaver gloves, and demi-broquins of scarlet Morocco, laced with black, and lined with fur, complete the dress. 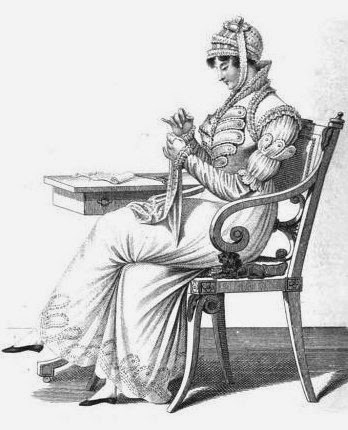 A white cambric frock, with a demi train; short sleeves fastened up in front with cordon and lasseli: a necklace formed of two rows of opal; the hair dresnsd in full curls, and confined by a demi turban of very fine muslin tied on the right side with a small bow; silk stockings with lace clock, richly brocaded, and plain black kid slippers. A three quarters pelisse, of dark willowgreen sarsnet, or fine Merino cloth, worn over a round dress of fine India muslin, richly embroidered, and trimmed round the bottom with lace,put on rather full. 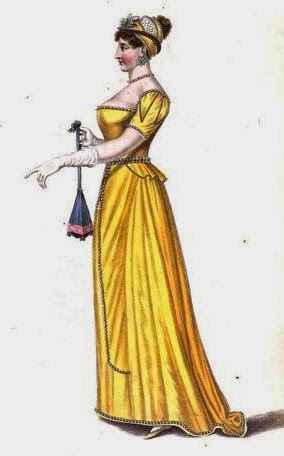 The pelisse made round in the skirt, like the short Indian coat; ans trimmed round the throat and wrists with broad stripes of black velvet; military front, with two rows of mother of pearl buttons, fastened down the front of the skirt with one row of the same and alternate tassels, the colour of the pelisse, which is confined at the waist by a gold belt. Yeoman’s hat of the same colour, materials, and ornaments as the pelisse, and finished in front with a flat ostrich feather. Half-boots of light fawn coloured kid, laced with dark willow green in front. Limerick gloves of pale straw colour. An embroidered white crape, or fine India muslin flock, with long sleeves, and trimmed round the bottom with fine lace, set on full, worn over a b’ush colour satin or sarsnet slip; the frock ornamented down the front of the skirt with heads and lace in the Egyptian style. Parisian mob, worn unfastened, of puckered pink, and white crape over pink satin. Small pink satin tippet, with full plaiting of lace. Cestus of pile pink, confined by a clasp of pearl. Pink satin slippers, with white rosettes. The jewellery worn with this dress is the shaded corne ian, or large pearls. A ruby pelisse of sarsnet, with a collar applique of white satin; the pelisse confined by a silver belt; sempstress bonnet of white satin, edge with van dyke lace, and ornamented in front with a full bunch of red ranunculus ; old English ruff, edged with fine narrow lace of a Vandyke pattern. Fig 1. Imperial bonnet of Maria Louisa blue, ornamented with strawcoloured French trimnming; three bows of ribband, the same colour as the bonnet, in front of the crown, which is high and spiral, the bowsedged with the straw-coloured trimming; the bonnet lined with white, and turned up in front. Fig. 2. The Norman bonnet, of rosecoloured satin, trimmed round the edge with white puckered crape, the crown ornamenented with alternate quiltings of white crape and rose coloured ribband. Fig 4. The Lejeune cap of fine spotted muslin, trimmed next the face with a very broad French lace and ornamented with rose coloured ribband. Fig. 5. 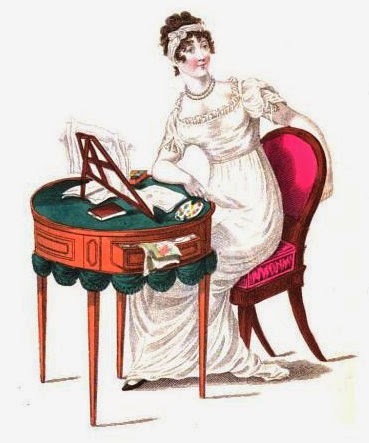 The coiffeure a l’indisposition, a mob of fine spotted muslin, with double border of clear book muslin, edged with narrow lace, a broad lace ornament falling from the crown towards the face. Fig. 7. and S. Dinner caps of white satin and lace intermingled, made in the toque, or French college style. Fig. 9. Close bonnet for morning visits, of amber satin, lined with white satin powdered with small spots, and which by being turned up, forms an edge all round the bonnet; two full bunches of white auricolas are placed in front, seperated by a rich fold of satin the colour of the bonnet. Fig. 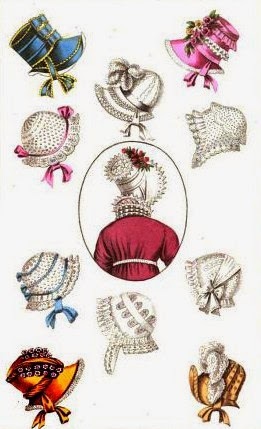 10 Dress bonnet of the colour of feuille morte, trimmed round the edge with striped ribband of the same colour, the crown ornamented fancifully with the same material; an immense plume of white gossamer feathers falling over the front, which is turned quite up, finishes this head dress. An high dress of fine French cambricor plain India muslin,richly embroidered round the bottom with a deep border; a demi sleeve, ornamented a l’antique surmounting the long sleeve, which is finished at the wrist by a narrow ruffle; the bust adorned partly en militaire, partly a l’antique, to correspond with the demi sleeve: the whole of the upper part of the dress ornamented by a profusion of lace, and finished at the throat by an old English ruff. Peasant’s cap, with two rows of lace set on full, confined under the chin by a band formed of the same material as the cap, and terminating in a bow on the crown. Plain black kid or jean slippers. 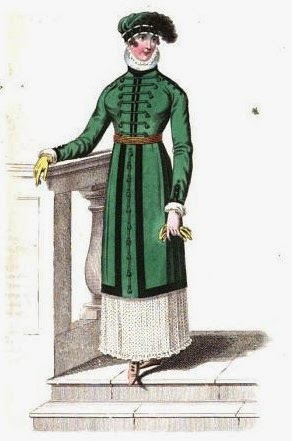 An habit of bright green, ornamented down the front, and embroidered at the cuffs a-la-militaire with black. Small riding hat of black beaver, fancifully adorned with gold cordon and tassels, with a long ostrich feather of green in front; or a green hat with black tassels and black feather. Black half boots, laced and fringed with green. York tea gloves. 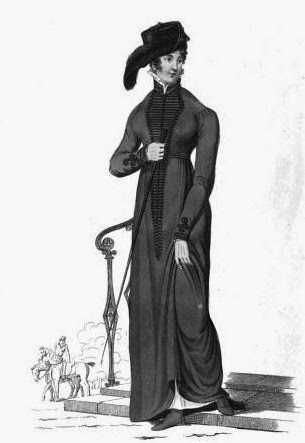 When this dress is worn as a cuticle or walking costume, it is made as a pelisse without the riding jacket, and confined round the waist by a fancy belt of black and green. 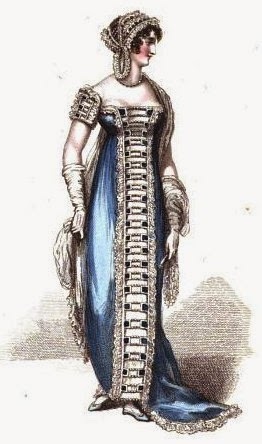 A robe of Imperial blue sarsnet, shot with white, with a demi train, ornamented with fine French lace down each side the front and round the bottom, the trimming surmounted by a white satin ribband; the robe left open a small space down the front, and fastened with clasps of sapphire and pearl on a white satin clip petticoat: short fancy sleeve to correspond with the ornaments of the robe. Parisian cap made open, formed of rows of fine lace and strings of pearl, the hair dressed a-la-Henriette of France, appearing between, and much separated on the forehead. Pearl necklace, and hoop earrings of the same. Scarf shawl in twisted drapery of fine while lace. White kid gloves and fan of ivory, ornamented with gold. Slippers the same colour as the robe, with white rosettes. This beautiful dress is the invention of Miss Walters, Wigmore Street, Cavendish-square. Which of these outfits is your favourite? I love the first one. It’s so bright and stylish!